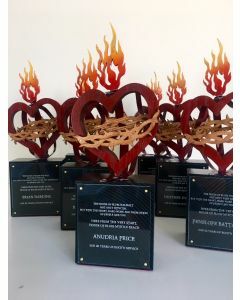 eQ can create custom awards for your event or organization in many materials including wood, acyrlic plastic, metal or paper. We have done a number of various awards for local and national groups including House of Blues, ASP / WSL, Venice Surf and more. We can work with you to mock-up and prototype everything prior to production to make sure you love the end result. Contact us today to discuss your next project at 310 305 1734 or info@studio-eq.com!